Salads don’t need to be boring, or leave you hungry, and this Thai Beef and Peanut Salad proves that. Bursting with flavour, low in carbs and packed full of protein, it’s a great post workout meal too. 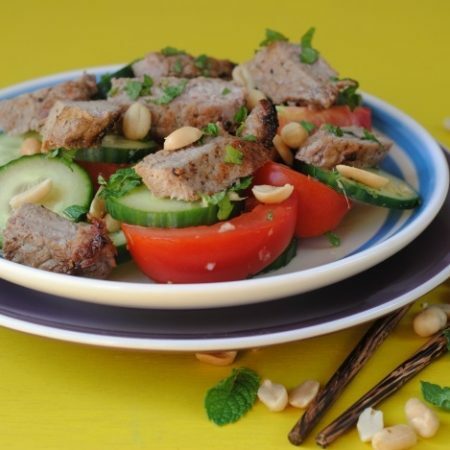 We don’t eat a whole lot of meat in our house, I would say we are at least 80% vegetarian, but when we do we make sure it is worth it and this Thai Beef and Peanut Salad is definitely worth it. Get a good quality piece of steak and you will have yourself a meal that you want to eat over and over again. I have spoken about it before, but Dave is not the biggest salad fan. If it is smothered in dressing and cheese, then he is on board, but that’s just the dressing and cheese that he likes. So, I am always looking for other ways to get a protein packed salad in to our meal routine, that still has plenty of veggies in it too and this definitely ticks all the boxes. You can have it with some rice, or potatoes, or do what we did and have it with some courgette (zucchini) noodles to keep the dish low carb. Are you still hooked to the Olympics? If you are, then I am sure that you saw Usain Bolt’s epic win. I mean, could he be any more smug? And rightly so! He is just so effortless when he runs. We are super proud of how well Team GB are doing too and second in the medal table is a fantastic achievement. Always a supporter of Team GB is The National Lottery, who have set up the Food Champions website to show you some of the recipes that help Olympians to refuel after a heavy workout and this recipe comes from Becky Adlington, who is Britain’s most successful ever swimmer. “She won two gold medals at the 2008 Olympic Games, becoming the first British swimmer to do so since 1908. She later claimed two bronze medals before an adoring home crowd at the London 2012 Olympics – making her and Katherine Grainger our most successful women Olympians of all time. Becky developed her love of swimming at her local pool in Mansfield, which has been renamed the Rebecca Adlington Swimming Centre in honour of her achievements. Becky has been awarded an OBE and has also had a pub, high speed train and now a recipe named after her! 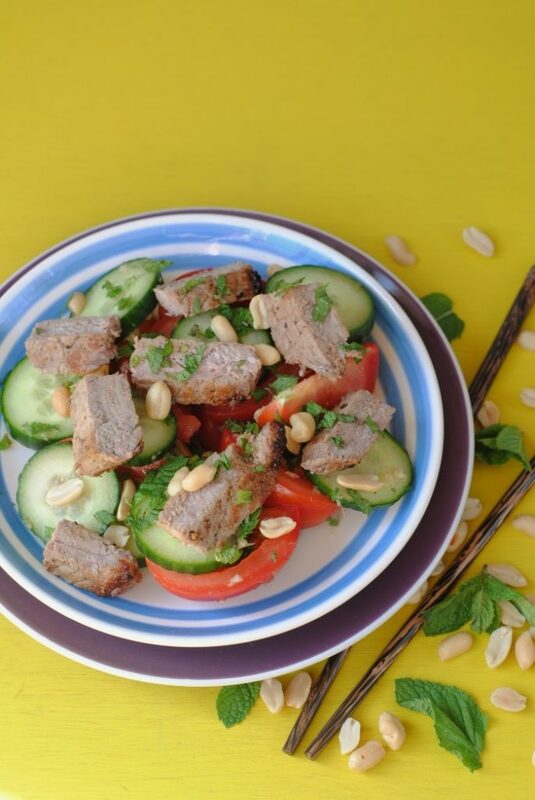 Becky’s diet is super important to her success, and this Thai Beef and Peanut Salad is one of her favourite recipes. Beef is a fantastic source of iron which helps to boost the production of red blood cells and contributes to robust health and ginger, garlic, mint and basil are all rich in anti-oxidants which boost the immune system. If you are inspired by the Olympics like I am, then head over to the Food Champions website for more recipes to fuel your workouts. I was fully vegetarian before I got pregnant, and then steak was one of the first things I craved. I mean, respect to my unborn daughter, she didn’t do things by halves when she wanted meat. As I say, steak wouldn’t be an every day thing for us, but it really does take this salad to another level. With the mix of the lime juice and soy sauce and the crunch from the peanuts, it is a little bit of a taste explosion. Salads don't need to be boring, or leave you hungry, and this Thai Beef Salad proves that. Bursting with flavour, low in carbs and packed full of protein, it's a great post workout meal too. Heat a sauté pan over a high heat. Season the steak and rub 1 tbsp of olive oil. Place the steak into the hot pan and cook for 2 minutes on each side. Once cooked allow to rest for at least 5 minutes. Meanwhile combine the remaining ingredients into a bowl and toss well. Slice the steak and serve with the salad. So awesome!! Thanks for sharing! I love your recipe! Everything looked so yummy!! I love trying different salads and this looks great for the summer. Oh I am hungry now. Looks delicious. I am not that adventurous with food but any kind of salad I love making. 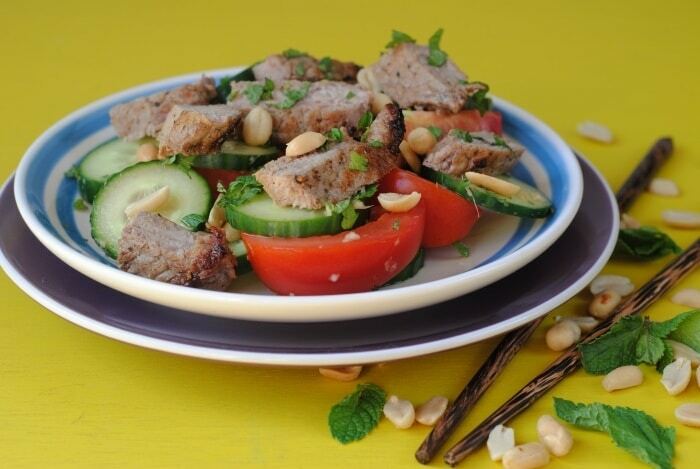 Sounds great – I think I’d cook my beef a little rarer, but I do love a thai salad. Thanks for the idea. This looks and sounds amazing! Would never in a millions years think of this combination. Definitely making this, seems like something I would love. I would have never thought of making something like this before! This looks really tasty – exactly my kind of thing. I rarely buy steak though I must say. I much prefer a restaurant to prefer it for me as I tend to over do it and I hate tough steak! This looks absolutely delicious!! I will need to try it! Looks great to use leftovers for lunch too! YUM! Thai food always wins my vote! 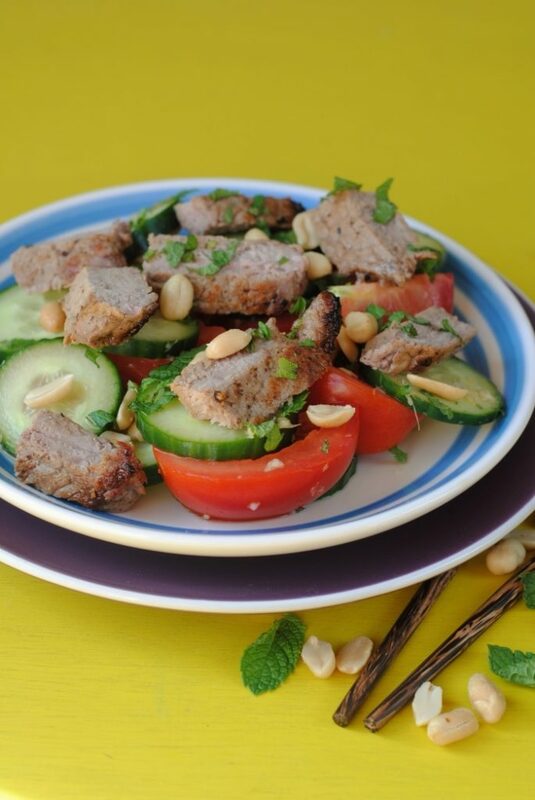 Thai beef and peanut is such a classic combination. Such a healthy cuisine, I love how meat is “just another ingredient” and not the “main event”. I’ve been loving the Olympics. And Becky Adlington’s commentary has been fantastic. Great salad!